We organised a Harley Eastern Panorama tour for our American passengers. They have been friends for over 30 years and left their husbands behind in Southern California. They called into a couple of countries before arriving in Sydney. 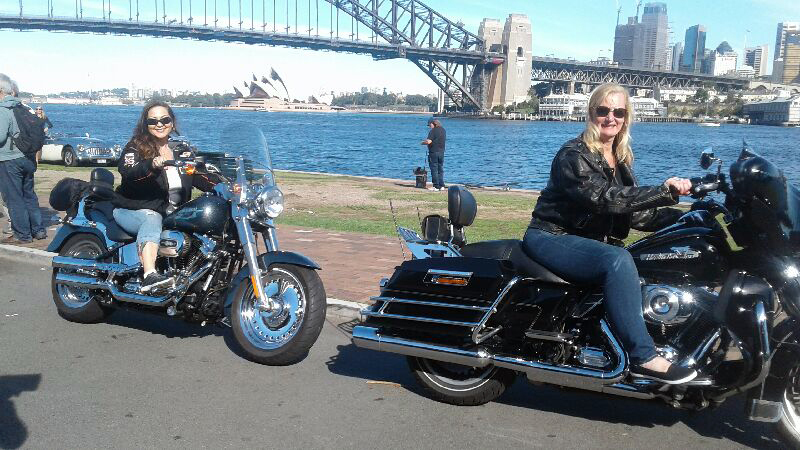 Before they left home they were told by other friends to definitely do a Harley ride in Sydney. They weren’t told who to do it with so they looked up rides on the internet. They liked our website the best, it looks smart and easy to look around. All those great reviews help. So they rang us and we organised two of our riders to do an adapted Harley Eastern Panorama tour. Jungle and Perry picked them up from their hotel in Walsh Bay. 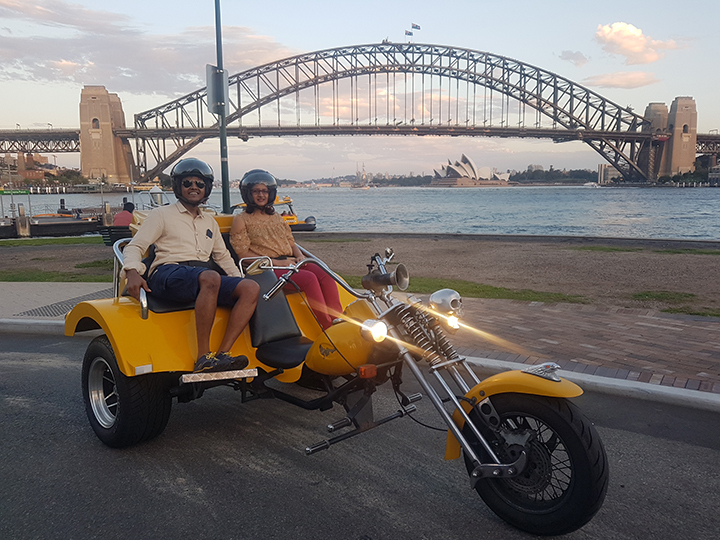 Firstly they rode over the iconic Sydney Harbour Bridge. It is always wonderful to see the steel arches from the back of a Harley. They stopped at Blues Point Reserve for photos. Another beautiful view that one never gets tired of. The Sydney Opera House just shines on a beautiful day. The view of the Harbour Bridge from a different perspective is also unforgettable. They rode back over the Bridge and headed to the Royal Botanical Gardens. They can ride along the eastern edge of the gardens until they arrive in the Domain-Yurong precinct. This area also has wonderful views across Sydney Harbour. You can see the Opera House and the Harbour Bridge when you look westwards. They stopped to have a look at the Sydney landmark Mrs Macquarie’s Chair. The chair was carved out of a sandstone rock ledge by convicts in 1810. Specially commissioned by Governor Macquarie for his wife Elizabeth who was known to love the area this is one of the best vantage points to view the sights of Sydney Harbour. As they rode back along the peninsula they could see Finger Wharf where Russell Crowe has a place. They rode into Woolloomooloo and past the famous Harry Cafe De Wheels. Famous for their pies and peas. They continued up into Kings Cross and rode along the main drag. It still has strip joints and a seedy reputation but it nothing like it used to be. They went past the iconic Coca-Cola Billboard sign. It is an advertising billboard erected in 1974 by the Coca-Cola Company. It is more often regarded as an iconic landmark than as an advertisement. Commercially, it is considered to be the premier billboard in Sydney and is the largest billboard in the Southern Hemisphere. It is commonly, though incorrectly, assumed to be heritage-listed. 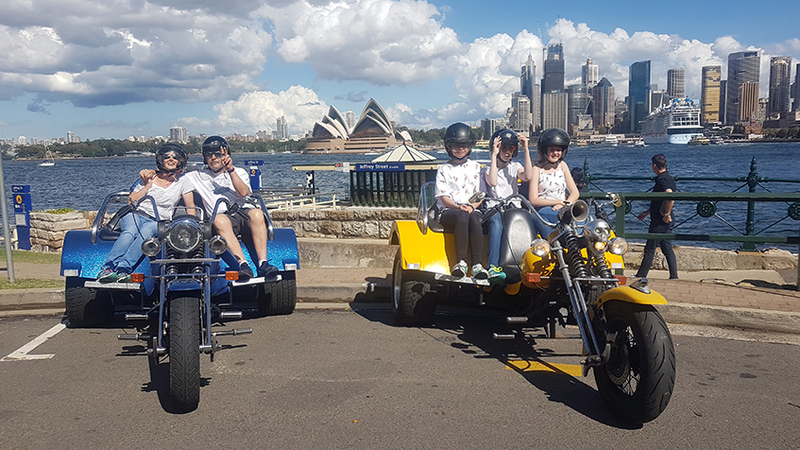 The Harleys then travelled along William Street into the city, around the Rocks and back to the hotel. The Harley Eastern Panorama tour was a great success. Susan + Tina loved every second of the experience.